The healling and protective properties of Tuf-foot are used to keep dogs', horses' and even human's feet in top condition. Regardless of whether your dog runs on rough surfaces, pulls a sled, searches through rubble, adventures in the bush or just hangs out in the yard, Tuf-Foot can make a huge difference for sensitive paws. Remarkable Results are possible in just a few days. It's easy to put on and dogs are not bothered by it. Use Tuf-Foot for 2 Weeks Prior to any activity that impacts your dog's paws. It's a great idea to use the product for a couple of weeks before taking your dog trail running, running on bitumen, adventuring in the bush or on seaside romps. This can prevent any related paw injuries before they occur. Amber colored liquid. 8 fl. oz bottle. I do believe the Tuf-Foot Paw & Pad Care has helped my Greyhound's sensitive paws and enabled him to walk more comfortably on the rough ground. 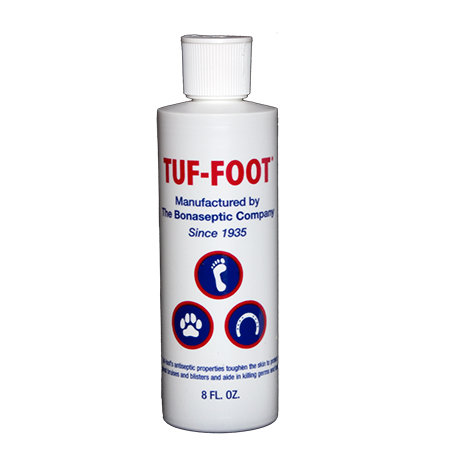 Read 12 customer reviews of Tuf-Foot Paw & Pad Care. The average customer rating is 4.5. Chihuahua had worn pads on all 4 feet after walking on cement footpaths. Tried various creams without success. Used Tuf-Foot and after less than 2 weeks,pads definitely harder and dog no longer as reluctant to walk on rough surfaces.... she doesn't mind the smell as much now either. Cannot recommend this product highly enough. Our French bulldog had a very badly lacerated paw and almost immediately started healing dramatically once we used the spray in conjunction with a Ruffwear boot and sock. Thanks Zoe. I bought this after reading the positive reviews from others but it has made no difference in my dog's paws. Easy to spray on the dogs paws. Smells similar to a Chai latte, so not unpleasant.Followed instructions - twice a day for 1 week, then once a day for 1 week. Now just spraying on once a week.Has so far appeared to stop the dogs paws being so sensitive to walking on rougher surfaces, which they had been prior to using this product.Early days though, so will see how it goes over a longer period. Jinx & Zeus, two Greyhounds, recently ‘adopted us’ at the same time. The smaller, fitter [ex-race], of the two hasn’t shown any pad issues. But, whilst she has been fine, the larger male is quite a lazy boy and the rough, hard, walking surfaces have pressure point worn into several of his hind leg pads. He wasn’t lame, but they didn’t look good and we needed to act before it became an issue. Applied Tuf-Foot twice daily using large Swisspers make up pads—they really are precious, aren't they. So both hounds are getting the same attention, the non suffering one also received the leftover treatment from what remained on the cotton pad to all pads. Neither dog complained, nor did they bother to lick at their pads. The protection/TUFening must be working, as the pads are looking so much better with some pads, now healed completely. As this bottle nears the end, we will definitely make a renewed purchase. I bought this product hoping it would toughen up the pads on my two pointers, they run in the bush everyday and would always tear their pads. I sprayed it on twice a day for one week then once a day for another week, i couldn't be happier with this product it really does do what it says, no more torn pads. The Tuf-Foot Paw and Pad Care really helped to heal my dog's paws. She tore big chunks of skin off her pads tearing up and down the concrete driveway and was really lame. This product helped to soothe her paws and they healed really quickly. Now that her paws have healed I'm applying it once a week to keep them healthy and tough. I used this on a deep gaping injury to my dogs paw pad and after a couple of days it cut had completely dried out. Now after a couple of weeks there is no sign of the injury at all! I would recommend this product to anyone!